Our reenactment group Merry Swan together with Häme Castle and friends arranged an event: Medieval food, everyday life and luxury, during the first weekend of December. I was displaying all sorts of vegetables and fruits that were most likely eaten in the castle during Medieval times. Representing luxury, I had payne ragoun and gyngerbrede for all the visitors to taste if they wanted to know how medieval delicacies tasted like. Having something to taste at the display was a huge success. Mervi had also baked different bread’s for guests to taste with homemade butter. She asked the spectators about how wealthy they were and then when hearing the response gave them either fine wheat bread, rye bread or barley bread all made from sourdough. She also baked some of bread at the site. Ah so much fun! Anyway I have tested this recipe once and it worked. Many people have been asking for the recipe so I will publish it now although normally I will spend hours and hours to read and test the recipe. So here it is..
Take a quart of hony & sethe it, skeme it clene; take Safroun, pouder Pepir & throw ther-on; take gratyd Brede make it so chargeaunt that it wol be y-lechyd; then take pouder Canelle & straw ther-on y-now; then make yt square, lyke as thou wolt leche yt; take when thou lechyst hyt, and caste Box leves a-bouyn, y-stykyd theron, on clowys. And if thou wolt haue it Red, coloure it with Saunderys y-now. Bring the honey boil in a pot. Keep simmering the honey about 5 minutes. Stir and make sure it will not burn. If you are using sandalwood to color the dish add it. Add saffron and pepper. Add dried bread crumbs and stir well. Take the mixture off the heat and let it cool. Sprinkle the cinnamon on a plate or cutting board where you are forming the pieces. When the mixture is not too hot you can cut it in pieces and form balls or use cutters to make different kinds of shapes. Dust the pieces with cinnamon or just roll the balls on the cinnamon. Garnish with whole cloves if you wish. Comments: Since these gingerbreads are not baked, they are more like candies than actual biscuit or cake. The dough feels like marzipan but it can lose its form a bit in storage. Also the temperature will affect the shape after a while. The ginger is actually missing in the recipe but the name suggests that it might have added to the dish anyway. Although this is not certain. Some other similar gyngerbrede recipes does have ginger in it. I decided not use the sandalwood either for coloring the gyngerbrede red this time. I do have sandalwood powder but I made this dish for the Häme Castle event and for the spectators to taste so I did not want it to be too exotic. Next time I need to test with the sandalwood and probably update the recipe after that. So at this point I don’t know how much sandalwood would be enough to color the dough, but my guess is that 1 teaspoon would do the trick.. perhaps less. Anyway the sandalwood is as the recipe says optional. I had no boxwood leaves for to garnish the gyngerbrede (I don’t know if and where to get the leaves here in Finland). I am not completely sure but I read that they might be poisonous so I would omit them. You can use whole cloves to garnish as the recipe says. Cherry time isn’t over yet (in Finland) so I will put my other projects (other recipes) on hold and write this down now, rather than waiting for the next year. 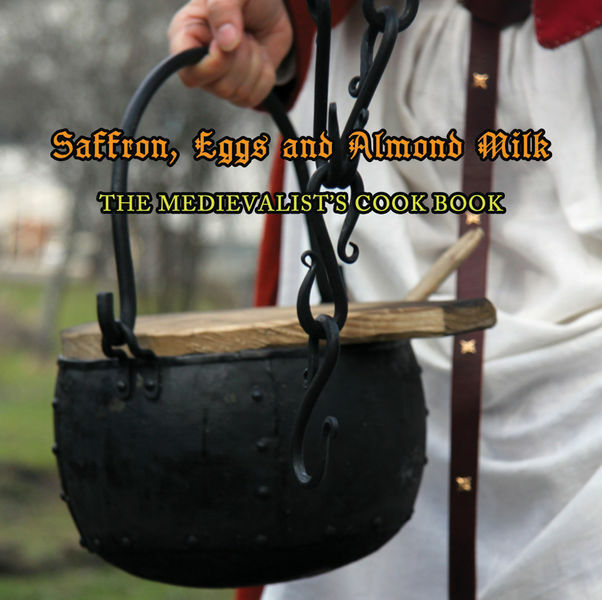 There are some variants of this recipe (both medieval and adapted) available on the internet. This was my first time I have made konkavelite so I decided to follow two similar recipes from Ein Buch von guter spise (c 1350). It was very good! So tasty! If you happen to have lots of cherries and you want to make a tart check this old recipe of mine. Zu einer schüzzeln ze machen. man sol nemen ein phunt mandels. und sol mit wine die milich verstozzen und kirsen ein phunt. und slahe sie durch ein sip. und tu die kirsen in die milich. und nim eine vierdung rises, den sol man stozzen zu mele. und tu das in die milich. und dim denne ein rein smaltz. oder spec. unde smeltze daz in einer phannen. und tu dar zu ein halbe mark wizzes zukkers. und versaltz niht, und gibz hin. Konkavelit macht man von kirsen. von den suren kirsen. daz sint wiseln. die sol man nemen. und von mandelkern eine guten mandelmilich machen. und mit eime wine die kirsen wol gesoten. und mit ir eygin brüe. und geslagen durch ein tuch. und denne gegozzen in die mandelmilch. und gar gesoten in eyme hafen. und dor du wol gerüert mit ris mele, und smaltz genue dor an geton, und auch würtze genue und zuker doruf. und versaltz niht. First make the almond milk. Simmer together the finely ground almonds, wine and water in a pot for about 5 minutes and stir occasionally. Take of the heat and let it rest for about 30 minutes. Stir couple of times. Pour the milk and the mass through a fine strainer or a cloth to a pot and discard the solids. Take of the stems from the cherries and put them whole in a pot with 3 dl red wine. Simmer until the cherries pop and they are done. Add water if needed. This takes about 20 minutes. Take the cherries out of the wine and pound them carefully through a strainer to the almond milk. Discard the stones and the skins. Take a little bit of the almond milk and cherry mixture to a cup and stir in the rice flour. Put the almond milk and cherry mixture on the stove and when it simmers add rice flour, spices, sugar (a pinch of salt if not using bacon fat) and lard. Boil briefly, stir and serve. Comments: If you use the fat from frying bacon, be careful not to over salt the pudding. You can substitute lard or bacon fat with butter. Using lard will make the pudding much more set when the pudding cools down. Spices are optional so if you wish you can add also little bit of other medieval spices than cinnamon and ginger. The recipe is actually hinting that this dish is supposed to serve warm but it is delicious if cold too. Suomenkielinen resepti löytyypi ihan justiinsa yläpalkista! The camping season is on and we just had a lovely weekend at Laukko Manor. Merry Swan group participated in Ancient Laukko Festival. Everything went so well. The weather, company, food, amount of tourists all were excellent! 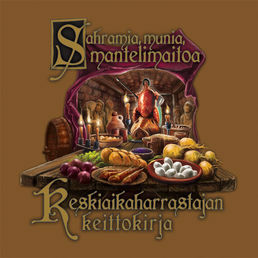 Now I am preparing for Hollola Medieval Fair which is this weekend. There we will be camping again, making food on open fire and churning butter. Displaying medieval cooking on open fire for the tourists and talking about the food. This time we will have a clay oven with us also and Lovisa from Sweden, who is a master with baking, has promised to bake for us. Cannot wait! Payne ragoun is a dish that is very easy to carry with you to a camping event like Hollola and I will be making a batch. There are couple variations available of the recipe in different manuscript text versions in Forme of Cury. What makes it interesting is that there is a word missing in some of the versions. The word is pynes which means pine nuts. It is the key ingredient in the recipe. I first looked at Samuel Pegge´s version of Forme of Cury and I suddenly realized that there were no mention of pine nuts in the recipe. So I did what I always do and dug out all the other translations and books I could find and checked what they said. I happen to have the Rylands manuscript in my iBooks. At this point I also realized that Medieval Cookery blog has blogged about the recipe in 2009. So that explained a lot. The recipe does not say how much sugar or how much honey to put in to it. I did a version of this recipe to Reader’s Digest Christmas issue 2017. Now I added a bit more sugar to the recipe and little less honey to test how it turns out. For my taste it is better now than before. The taste of honey can be very dominant but not in this version I think. Tak hony sugur cypre & clarifye it to gider & boyle it with esye fyre & kepe it wel from brennyng & whan hit hath y boyled a while tak vp a drope there or with thy fynger & do hit in a litul water & loke yf it hong to gider & tak hit fro the fyre & do therto pynes the thryddendel & poudour gynger & stere it to gyder tyl hit bigynne to thyk and cast it on a wete table. Lesche hit & serue hit forth with fryed mete. on flesch day or on fysche dayes. Mix together sugar and honey in a pot and put it on a moderate heat. Keep stirring the mixture so it will not burn. Be careful not burn yourself with the mixture. Let it boil for awhile until the mixture reaches the soft ball stage which means the mixture become light and foamy with lots of small air bubbles. Then take it of from heat and mix in pine nuts and ginger. Then pour the mixture on a baking sheet or watered/ oiled surface. Let it cool and break. Serve with fried meat or fish like the original recipe suggests or eat it as it is. This summer I have been able to make couple of my long-time dreams come true. First, I have a tent (small cone) for 2 to sleep in events. Second, now I have a fireplace in backyard where I can actually cook on open fire. Third I have a churn (churns). Making my own butter with a churn has been a long-time dream. I have been looking for the right churn for some time. Finally asking around I found a person from Denmark who was able to sell me churns. Now after a busy spring and after vacation I took my churn and made butter for the first time. It was really easy to do! First I soaked the churn in hot water for some hours. I used only cream this time for making the butter. Old traditional Finnish and European way is to make butter from cultured (soured) cream. That can be done easily adding for example 1 tablespoon of cultured milk (piimä) or Nordic sour cream (kermaviili) to 1 liter of cream and let the cream rest in freezer for a day. It is matter of taste how people like their butter. Me, I prefer my butter either non cultured or if then just a little bit cultured. If the butter goes too sour it tastes stale. Now the butter was ready for to scoop from the bottom of the churn. Save the churn buttermilk for making bread, it is very tasty. After that it was time to wash the butter carefully with cold water. It is good to strain and wash away the churn buttermilk as carefully as possible. That way the butter stays fresh longer. When the washing is done, salt the butter with 1 teaspoon of salt. Put it in a bowl and storage in the freezer. The butter will keep from couple days to a week. After couple of days, my butter still smells and tastes fresh and good. And finally couple pictures and videos from second week of June when our group went to Middelaldercentret, Nykobing Falster with friends. It was a textile week but textile makers needed to eat too. Dyers house. We used the fireplace for cooking. We made lots of pies. Mushroom pies and meat pies. And that is me chopping cabbage. Asparagus season is here! This time I decided to do two different recipes. The first recipe is Italian and from Libro della cocina, Anonimo Toscano (around the end of the 14th century and beginning of the 15th century). It is the classic Asparagus with Saffron dish that is very well known among living history geeks and one version can also be found in our cooking book Saffron, Eggs and Almond Milk. I have made some changes for the recipe (mainly spices and for the cooking instructions). The second one is from a Catalan source Sent Sovi (around middle of 14th century). It is dish that is easy to make and very tasty. Later during 15th century Bartolomeo Platina, a famous italian writer and gastronomist of that time, wrote in his book “De honesta voluptate et valetudine” about health benefits of eating asparagus. He wrote that if asparagus was eaten during the first course it would combat flatulence of the stomach and soften the bowels. But also it would bring clearness of the eyes and that it is good for chest and spine pains and for ills of the intestines. He wrote that adding wine to asparagus would make the benefits more effective but eating too much asparagus will be dangerous for the health. Source: Platina, On Right Pleasure and Good Health, Milham E.
Togli li sparaci e falli bollire; e quando sieno bulliti, ponli a cocere con oglio, cipolle, sale e zaffarano, espezie trite, o senza. Snap off the dry ends of asparagus and carefully peel the asparagus ends if needed (if they are very thick and woody, usually not necessary in my opinion). Place the asparagus on a large frying pan and add about 1,5 dl water and let it simmer for about 5 mins. Be careful not to overcook. Pour the reminding water away and add oil, chopped spring onions and spices. Fry 6-10 minutes or before they are done. Serve warm. Comments: The original recipe tells to use onion which is most likely common onion. Scallions are mentioned twice in the source. In one recipe the scallions are mentioned with onions. So most likely the common onion is what was meant for this dish. I was rebellious and wanted to use spring onion because they were available. The original recipe doesn’t specify what kind of ground spices to use. The recipe only suggest to use ground spices or not to use them. It is up to you. There is 184 recipes in the source and I quickly counted that there is about a bit over 70 recipes that does not specify what kind of ground spices (good spices, fine spices, some spices..) are used in the dish. Pepper and saffron were most commonly mentioned separately (sometimes with other “spices” and sometimes without). Ginger, cinnamon, cloves, nutmeg, cardamom were mentioned couple times. Also seeds like mustard, anise, fennel, cumin and coriander were mentioned. Some herbs too but those I did not count this time. I choose to use some most common spices. Serve this dish for 4 people as an appetizer or with other main course dish. Espàrrecs si vols fer; quan seran perbullits e sosengats mith-hi vin blanc e espècies comunes e un poc de bon sucre blanc. Snap off the dry ends of asparagus and carefully peel the asparagus ends if needed (if they are very thick and woody, usually not necessary in my opinion). Place the asparagus on a large frying pan and add about 1,5 dl water and let it simmer for about 5 mins. Be careful not to overcook. Pour the remaining water away. Add oil and fry about 6 minutes and add white wine and spices. Boil well and serve hot. Comments: The original recipe does not specify what kind of common spices were supposed to use for the dish. There is 87 recipes in Sent Sovi. Most common spices in the recipes are cinnamon, ginger, cloves and salt. Also pepper (and saffron) were mentioned several times. Other spices like nutmeg, grains of paradise, cubebs, long pepper was mentioned. Like in many other medieval dish there is sugar in ingredient list and the dish tastes sweet because of it. Sugar enhance other flavors in the dish. Serve this dish for 4 people as an appetizer or with other main course dish. Poached eggs in golden sauce…nom! It is a dish that is important to serve right away. When the eggs and the sauce cool it won’t taste as good. Living in the countryside, we have our own chickens but they are small cochin chickens that lay very small eggs. So three our small eggs are as big as two normal sized eggs. I am using our own eggs for cooking when ever we have them, which is almost all the time. Funny thing is that one would thought that the chicken stop laying eggs when it is dark and winter. Here in Finland it is really cold at the moment and winter is in its peak and we get eggs every day. I have moderated the recipe for normal sized eggs. I cannot tell for sure how big the medieval chicken eggs were but there is some pictorial evidence like the one below (picture from Tacuinum sanitatis) where you can see that the eggs were probably same size than our modern day eggs that you can get from grocery store. Take ayrenn and breke hem in scaldyng hoot water and whan þei bene sode ynowh take hem up and take zolkes of ayren and rawe mylke and swyng hem togydre, and do þerto powdour gyngur safroun and salt, set it ouere the fire, and lat it not boile, and take ayrenn isode & cast þe sew onoward & serue it forth. Break an egg to a glass gently so the yolk won’t break. Make poached eggs one by one. Bring the water boil in a large pot. When it is simmering nicely add wine vinegar (if you want, it will make the poaching easier but it is only optional) and make a whirlpool with your spatula. Drop the whole egg from the glass in the middle of the whirlpool. Let it simmer in a slowly boiling water for 3-4 minutes and take the egg away with a slotted spoon. Whisk milk and egg yolks together for about a minute in a pot. Turn the heat on and keep whisking. Add saffron, ginger and salt. When the sauce starts to steam it is almost done. Keep whisking for couple of seconds and take the sauce away from the heat and keep whisking. Be careful not to boil the sauce. Serve hot with poached eggs. Today I have been making Pochee and Sawse Madame from Forme of Cury with Joonas. But now something really really easy. This is quick and tasty vegetable recipe and it is easily done wherever (modern kitchen or camp fires). This is definitely going to the list of what we will cook next summer when we are camping with Merry Swan group. The recipe is adapted from Le Ménagier de Paris and it is one of those short descriptions on how to cook turnips. Turnips are firm and difficult to cook until they have been through the cold and frost. Cut of the head and tail and other whiskery rootlets or roots. After peeling them, wash in two or three changes of good, hot water; then cook them in steaming meat stock of either pork, beef or mutton. Because after cooking them, they slice them up and fry them in pan and sprinkle them with spices. Peel the turnips and boil them in strong meat stock whole for about 20 minutes. Take them off from the stock and cool a little bit. Slice the turnips and fry the slices in butter or lard. Sprinkle spices and salt if needed and serve hot. Comments: I decided to use cinnamon, ginger and cloves as spices to sprinkle on top of the turnips. They are very common medieval spices. But since there are no specific information about the spices any medieval goes. This is one of the recipes I made for Finnish Reader’s Digest Christmas issue last year but I have changed the recipe a bit. I was planning to post this recipe during Christmas time but had a nasty cold for some weeks and that’s why the plans changed. Cormarye could be a really nice substitute for Christmas ham during Christmas time. This is one of my all time favourite recipes. Suomenkielinen resepti löytyypi yläpalkista <3 ! Take Colyandre, Caraway smale grounden, Powdour of Peper and garlec ygrounde in rede wyne, medle alle þise togyder and salt it, take loynes of Pork rawe and fle of the skyn, and pryk it wel with a knyf and lay it in the sawse, roost þerof what þou wilt & kepe þat þat fallith þerfro in the rosting and seeþ it in a possynet with a faire broth and serve it forth witþ þe roost anoon. Cormarye before serving it with sauce. Garnished with fried garlic. Ground together coriander seeds and caraway seeds. Peel and mince garlic cloves. Mix together the spices, garlic and wine. Take off the skin if there is one on your pork loin and stab the pork loin surface couple times with a knife. Put the loinin a large casserole and salt the meat with generous amount of salt and pour the wine and spice mixture on top. Let the meat rest if you wish for couple of hours or overnight in a fridge but remember to take it out and let it warm a bit before roasting. Preheat the oven to 225 Celsius. Place a thermometer in the pork if you are using one. Put the casserole in the oven for 15 minutes and then turn the heat to 175 Celsius. Let the pork loin roast slowly until it is completely cooked inside (inside temperature 75 Celsius). Baste the meat several times during the roasting, with the cooking liquid and add more wine if needed. After the meat is done take it from the casserole and let rest a bit before cutting. Meanwhile make the sauce. Take the cooking liquid and combine it with good meat stock in a pot. Simmer it for few minutes. Cut the meat and place it back to the casserole and pour over the sauce. Comments: There are not so many food items I dislike but I have to say caraway is one of them. However this is one of few recipes I do like and I don’t think the taste of caraway is too overpowering. Elviira who was substituting us with Johanna took this picture. Last weekend I went to Turku Castle with Merry Swan group to show and tell about medieval crafts. We had also a table full of ingredients like different kinds of spices, vegetables, dried fruits, nuts etc. and I was standing behind the table telling tourist groups about how did medieval food taste like. We had spices for example long pepper, cubeb pepper, grains of paradise and also vegetables like purple and yellow carrots. So there was food items that were not so familiar to spectators. Then on top of that I had 5 short lectures about medieval food. We had different kinds of textile arts at the display. Mervi was making intarsia. Riku displaying the candles. Picture by Mervi. Piia and Ulla-Mari at the textile display. Picture by Mervi. I forgot to mention that quince (Cydonia oblonga) is very often confused with flowering quince (Chaenomeles japonica) which are two completely different plants. Flowering quinces can be cultivated in Finland. As far as I have heard you cannot get the quince (Cydonia oblonga) survive in our climate. I was confused when some time ago I was talking with my colleague who insist that they have a quince tree (or more like bush I think) at their backyard. But of course she mean the flowering quince! You can use it for making marmalade aswell but keep in mind that it is not the medieval fruit they used in Europe at that time. There went my dream of cultivating my own quince fruits :(. Anyway on a more happier side note there is now a Finnish translation available at “Reseptit” section and the recipe is also saved at the upper bar section. Unohdin mainita viime postauksen yhteydessä, että tosiaan kvitteni (Cydonia oblonga) ja ruusukvitteni (Chaenomeles japonica) menevät helposti sekaisin. Ne ovat kaksi eri lajia, joista ruusukvitteniä voidaan kasvattaa Suomen olosuhteissa, kun taas kvitteniä ei. Ihmettelinkin hetken kun työkaverin kanssa keskustellessa ilmeni taannoin, että hänen pihallaan kasvaa kvitteni puu. Hän taisi tarkoittaa ruusukvitteniä ja minä kuulin ehkä väärin että puu, vaikka kyseessä taitaa olla ennemminkin pensas. Ruusukvittenistä saa myös hyvää hilloa, mutta kannattaa muistaa, että se ei ollut sama hedelmä, jota käytettiin keskiajalla Euroopassa. Suomenkielinen käännös kvittenimarmeladista löytyy nyt tuolta yläpalkista kohdasta “Reseptit”.